Yetti Sanni, Fadekemi Ogunwa, and Kosy Frances Anyanwu at Andela's first all female boot camp in Lagos, Nigeria. You know you're onto something when you have Mark Zuckerberg and Google behind you. Andela, a two-year-old startup, trains software developers in Africa and gives them full-time roles at international companies. It already employs nearly 200 engineers in its offices in Nairobi, Kenya, and Lagos, Nigeria. On Thursday, it announced that it has banked $24 million in a round led by Mark Zuckerberg and Priscilla Chan's fund, the Chan Zuckerberg Initiative. It also scored a new investor, GV (formerly Google Ventures) in the fresh round of financing. The startup is incredibly selective: It's received more than 40,000 applicants for its job placement services and it accepts just 0.7%. It accepts applications on a rolling basis and candidates are whittled down through a multi-part application process. It includes skills and psychometric tests, an interview, and participation in a two week computer science bootcamp, which take place at least once a quarter. They're evaluated on things like how they interact with classmates and contribute to the community -- even things as small as picking up trash. At the end of the process, a select portion become Andela developers and spend six additional months training at Andela. Finally, they're paired with a partner company like IBM (IBM), Google (GOOG), Microsoft (MSFT) and Facebook (FB). In all, it's a four-year paid gig for those chosen. "There are five open jobs in the U.S. for every software developer looking for one. It is a challenged ecosystem," said Jeremy Johnson, Andela's cofounder and CEO. "We're able to tap into what I argue is the largest pool of untapped brain power in the world." Andela is also adamant about working on getting more women into technical roles. This is another big pain point for U.S.-based tech companies. Just 20% of software developers are women -- and tech firms have increasingly promised to do better on inclusion. Andela has a company-wide goal that 35% of its software developers are women, according to Christina Sass, one of Andela's four cofounders. In Kenya, they were seeing a dearth of female applicants. "We just weren't where we needed to be. We struggled to have that percentage," Sass said. "It's getting the word out there to young women that we're an employer to be actively excited about. Then getting to their families that Andela is a safe place to work." So Andela tried a different strategy, which Sass referred to as "a very disciplined effort." And it worked. This spring, it hosted its first-ever all female bootcamp in Kenya. 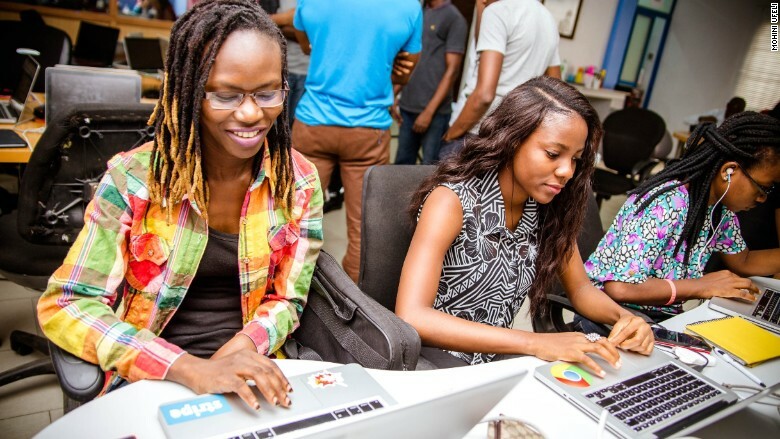 It targeted local women, putting up ads for Andela on social media and sending its female software developers to recruit in person. They managed to get 1,000 female applicants, selected 41 to participate in its bootcamp, and ultimately accepted 9 into Andela. "Some women didn't apply [previously] because they didn't want to compete against guys. Some said, 'I'm afraid of disappointment,'" said Joshua Mwaniki, Andela's director of operations in Kenya. Now, 17 of Andela's 48 developers in Kenya are women -- or 34%. In Nigeria, 21% are. As part of the new funding, Andela will expand its network of developers and launch in a third African country before 2017.